Breathe in memories of home with a candle that evokes the special fragrances of your native state. Crafted in Oregon with clean-burning (and long-lasting) soy wax, each state-centric candle combines scents that captures the essence of each location. Gave this as a birthday present & my friend LOVES it!! Reminds him of good times!! Thanks Grommet!! Great gift for an adult son away from home! Not sure what to say. I opened the top and felt like I was in the woods of Oregon! Hope he will love it too! Bought this for a friend who use to live in Michigan. Hope she loves it! 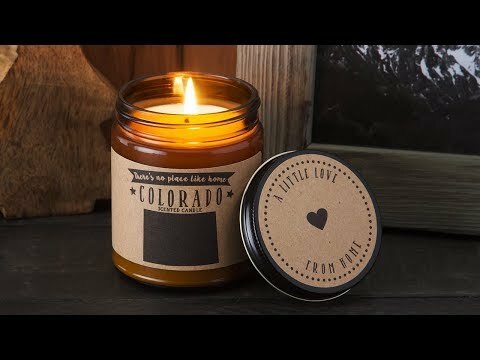 No Place Like Home candles are crafted to capture the scents of what of makes each state special. Like the fragrance of sweet rain and lush forest greenery, that reminds Maker Sandrine Froehle of Oregon, where she lives and where the candles are made. Or the combination of tart cherries and lake water that sums up Michigan summer. Sandrine took her love of all things geographical (especially maps) and a background in design and combined them in a distinctive tribute to each state. The state-centric candles are made with soy wax, which is a cleaner burning (and longer-lasting) alternative to traditional wax. You’ll enjoy up to 50 hours of the scents of home.